A long line of actors stood in a hallway of the Orlando Repertory Theater. They were waiting to audition. Britt Daley with her boom box strutted down the hall. The cameraman used a steady cam to go down the hallway and then he backed out the stage doorway and crouched framing Andy Matchett who was strumming his guitar. Andy did a double take when Britt walked past and he involuntarily strummed a twangy wolfs call on the guitar. His T-shirt read, "Popular" and he wore a Dog Powered Robot button on the guitar strap. 0ne of the lyrics in Britt's "One and Only" song pointed out,"You're wearing that T again." Andy's hair swelled to an Elvis styled wave in front. He wore a neat little hip amplifier. The shot was executed again and again until it felt right. One of the stage hands tested the hallway's light levels, fortunately it was already perfectly lit. 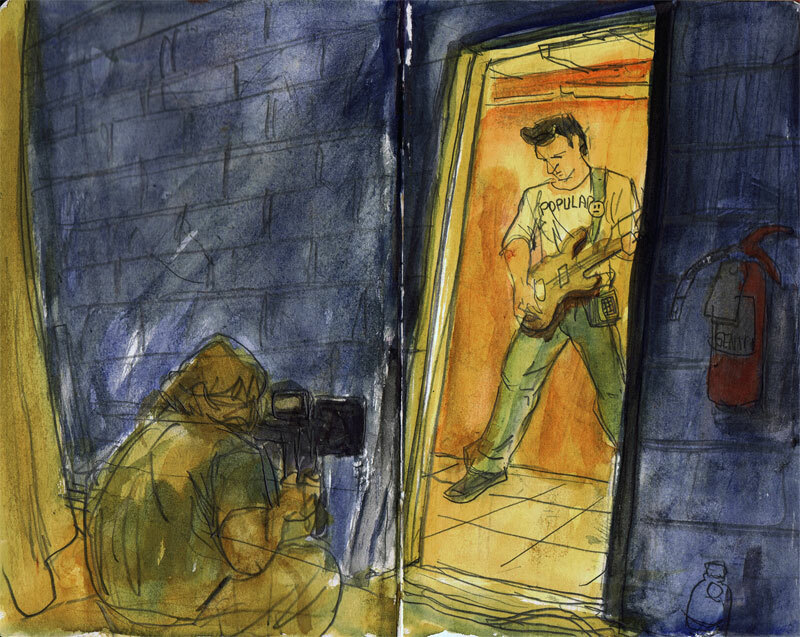 I couldn't sketch in the hallway without getting in the shot so this doorway was my only option to sketch the scene. My back was up against some stage curtains and ropes and wires snaked all around me. Andy of course is the lead singer in Andy Matchett and the Minx. This local band puts on a show that will rock your socks off.